PIA's first brand new Boeing 720-040B (registration AP-AMG) photographed during pre-delivery test flight in December 1961. Following are January 2, 1962 PIA Boeing 720-040B (registration AP-AMG) record flight details on FÃƒÆ’Ã‚Â©dÃƒÆ’Ã‚Â©ration AÃƒÆ’Ã‚Â©ronautique Internationale (FAI) website www.fai.org. Arrival of PIA's very first Boeing 720-040B jetliner (registration AP-AMG) at Karachi Airport on January 2, 1962 after a record setting flight from London. With representatives of FAI (Federation Aeronautique International) on board to monitor the official timings, AP-AMG on its delivery flight under the command of PIA's ace pilot Capt. Abdullah Baig (standing - 3rd from right in the photo) with Capt. Taimur Baig (standing - 5th from right in the photo) as his co-pilot completed London to Karachi flight in 6 hours 43 minutes and 55 seconds, the record which to this day remains unbroken!! Capt. Khusro Nawaz Khan (standing - 2nd from right) and Flight Engineer Hassan Mirza (first row - 1st from right) are also seen in this photo. Every Time i see these pics. i feel proud to be a BAIG . any information about Capt. Abdullah Baig ? riz wrote: Every Time i see these pics. i feel proud to be a BAIG . I also feel proud as a Pakistani, especially since the record stands to this day. The PIA pilots seen in photo taken at Karachi Airport after completion of AP-AMG record flight are like galaxy of shining stars. All those pilots have special place in the history of PIA and Pakistan's civil aviation. Capt. Abdullah Baig and Capt. Taimur Baig were among PIA and Pakistan's first jet captains. 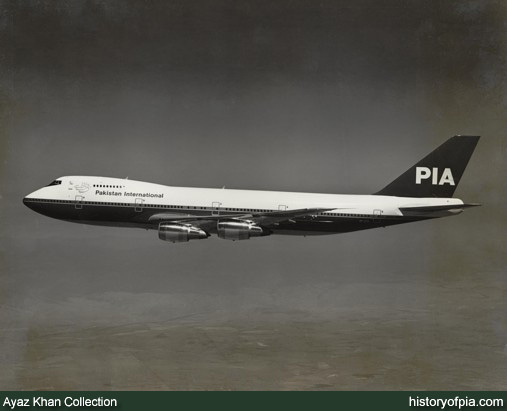 And the first Boeing 747 (AP-AYW) in PIA livery to land in Pakistan in 1976 was flown by Capt. Shaukat H. Khan with Capt. Khusro Nawaz Khan as co-pilot. Here's another photo related to topic subject. FAI (Federation Aeronautique International) representative presenting "Diplome de Record" certificate signed by Secretary General FAI to Capt. Mian Aziz (right) for completing New York to Karachi non-stop flight in record time. 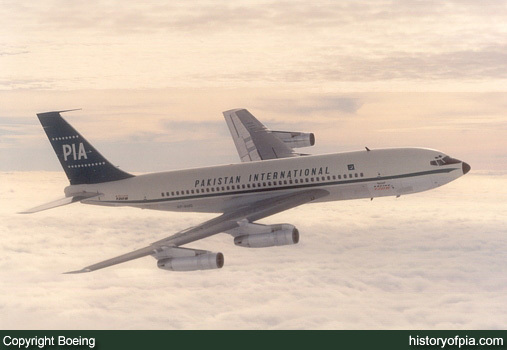 On October 21, 1974, PIA's brand new McDonnell Douglas DC-10-30 tri-jet (registration AP-AXE) under the command of Capt. Mian Aziz completed its delivery flight from New York to Karachi in 13 hours, 3 minutes and 53.2 seconds. PIA pilots for some of airline's other aircraft delivery flights. Backside of PIA's first brand new Boeing 747-240B Combi (AP-BAK) pre-delivery test flight photo signed by PIA's Director of Corporate Development S. Ajaz Ali who had accepted delivery of AP-BAK on PIA's behalf in Seattle. This photo was presented to Capt. Shaukat H. Khan during AP-BAK delivery flight from Seattle to London on July 26, 1979 when the aircraft was flying under Capt. Shaukat's command. 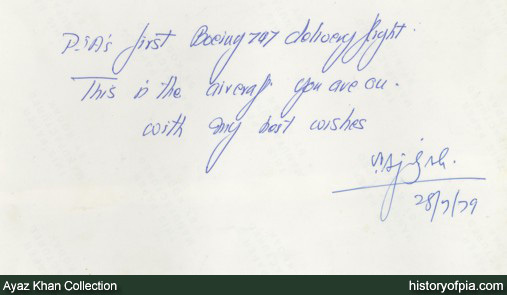 Copies of same photo signed by S. Ajaz Ali with same caption were also presented to everyone aboard the delivery flight including PIA crew and personnel, Boeing officials and media representatives. 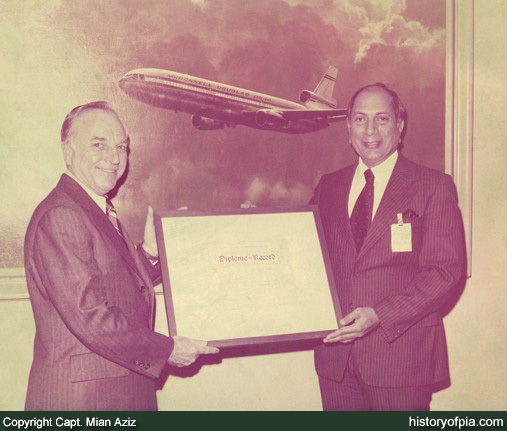 The photo's caption was actually handwritten by PIA Chief Engineer Research and Development Mohammed Saeed and then signed by S. Ajaz Ali. Front side of PIA Boeing 747-240B Combi (AP-BAK) pre-delivery photo. Copies of this photo with its backside signed by PIA's Director of Corporate Development S. Ajaz Ali were presented to people aboard the aircraft on its delivery flight from Seattle under the command of Capt. Shaukat H. Khan. PIA's fifth new Airbus A310-308 (AP-BEQ) landed at Islamabad Airport on December 23, 1993. AP-BEQ on its delivery flight was flown by Capt. Jehanzeb Afridi with Naveed Shahbat as co-pilot. AP-BEQ was handed over to PIA at Airbus Industrie facility at Toulouse, France. From France AP-BEQ flew to London and from London it operated its first commercial flight for PIA to Islamabad. AP-BEQ under the command of Capt. Jehanzeb Afridi completed London to Islamabad flight in 8 hours and 40 minutes. Capt. Jehanzeb Afridi on arriving at Islamabad said "the plane is simply the best, and it was my privilege to fly the machine on its inaugural flight". Abbas Ali wrote: completed London to Karachi flight in 6 hours 43 minutes and 55 seconds, the record which to this day remains unbroken!! Anyone knows the actual route flown and how much was the actual distance traveled. In 1962, USSR airspace was not open for the commercial traffic b/w Asia and Europe. Flight must be over southern Europe/Mediterranean/North Africa/ME - and if 720B could actual fly that far non-stop or was it a delivery flight with no load ? ^ PIA Boeing 720-040B (AP-AMG) record making flight was delivery flight without revenue passengers as far as I know. Here, I would also like to add that AP-AMG delivery flight from Seattle to London was flown over the polar region making PIA the first airline from the east to fly over the polar region. Although I don't have exact route details for London-Karachi segment of AP-AMG delivery flight but one thing I've read is that while planning London to Karachi segment of aircraft's delivery flight, PIA crew found upper winds favourable due to presence of jet streams and PIA pilots decided to attempt to create new record for fastest flight from London to Karachi by a passenger aircraft. According to memories of AP-AMG record breaking flight shared by Capt. Taimur Baig in book titled 'I Remember' authored by Enver Jamall, everything went well on the record making flight, the upper winds lived up to PIA crew expectations and the Boeing 720B performed beautifully. Representatives of FAI (Federation Aeronautique International) were aboard the aircraft to witness and record flight timings. Was this all planned to make the record flight? Seems to be that the crew was notified in pre-flight breifing with the weather conditions which favoured in the flight record making. Were the representatives of FAI were invited aboard for this particular flight or it is common practice by FAI to send their representatives on all such delivery flights? ^ On getting info about favourable wind conditions, PIA crew decided to attempt record making flight and FAI representatives were invited by PIA to witness and record flight timings. This is true as i have one of the 2-3 plaques that i know of were given to flight crew on this delivery flight, other one is at Capt. Fazal Uddin Haqqi's home including 3 beautiful factory models of A300 in green n gold livery. I have tried few times in past to get one of those A300 models but he refuses to give it to me n i do understand it also. I will take a picture of the plaque once i get home and will poet it here. PIA's very first Vickers Viscount 815 (AP-AJC) on its delivery flight from London, United Kingdom to Karachi, Pakistan, in January 1959 was also flown by Capt. Abdullah Baig. AP-AJC delivery flight route under the command of Capt. Abdullah Baig was London-Rome-Beirut-Bahrain-Karachi. 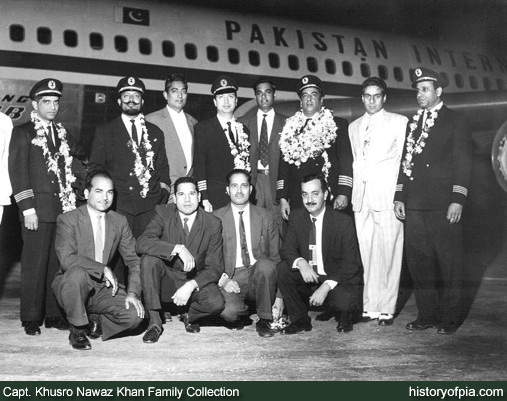 Some more images related to 1962 PIA Boeing 720B record breaking flight. 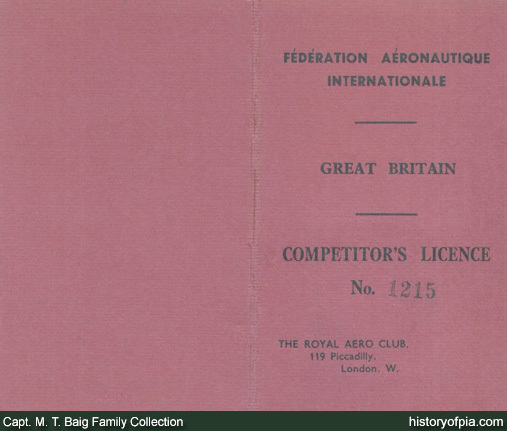 Cover of Competitor's Licence No. 1215 issued by FÃƒÆ’Ã‚Â©dÃƒÆ’Ã‚Â©ration AÃƒÆ’Ã‚Â©ronautique Internationale to Capt. Taimur Baig for attempt to break London-Karachi speed record with PIA's first brand new Boeing 720-040B (AP-AMG) on its delivery flight to Pakistan. 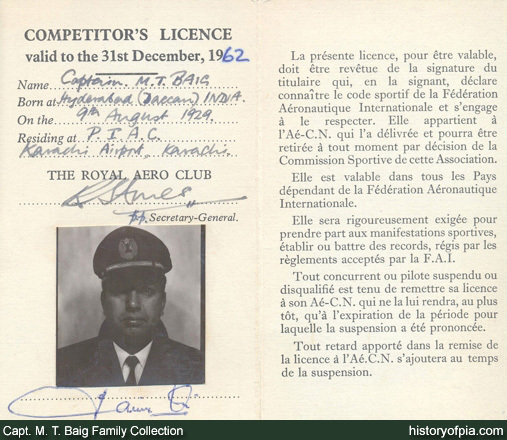 Competitor's Licence valid to the 31st December 1962, issued by FÃƒÆ’Ã‚Â©dÃƒÆ’Ã‚Â©ration AÃƒÆ’Ã‚Â©ronautique Internationale to Capt. Taimur Baig for attempt to break London-Karachi speed record with PIA's first brand new Boeing 720-040B (AP-AMG) on its delivery flight to Pakistan. The record breaking flight was piloted by Capt. Abdullah Baig and Capt. Taimur Baig on January 2, 1962. Capt. Abdullah Baig and Capt. 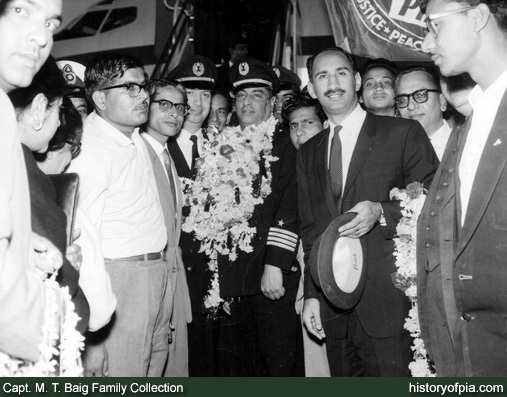 Taimur Baig welcomed with garlands at Karachi Airport after completing speed record breaking flight from London to Karachi on January 2, 1962 with PIA's brand new Boeing 720-040B (AP-AMG) on its delivery flight. PIA's dynamic Managing Director Malik Nur Khan is also seen in this photo. 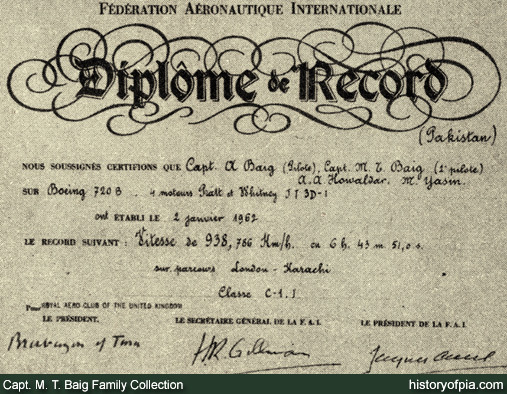 FÃƒÆ’Ã‚Â©dÃƒÆ’Ã‚Â©ration AÃƒÆ’Ã‚Â©ronautique Internationale Diplome De Record issued to PIA's Capt. Abdullah Baig, Capt. Taimur Baig, Flight Engineer A.A. Howaldar and M. Yasin for breaking London-Karachi flight speed record with PIA's brand new Boeing 720-040B (AP-AMG) on its delivery flight from London to Karachi on January 2, 1962. According to record details on this certificate, the PIA Boeing 720B powered with four Pratt & Whitney JT3D-1 engines established London-Karachi flight speed record in 6 hours, 43 minutes and 51 seconds at an average speed of 938.786 Km/h. Class C (Aeroplanes) with Sub-class C-1 (Landplanes) is for the PIA Boeing 720B shown in this certificate. Abbas, where is AP-AMG now, it she still alive and flying or is she in a museum. I was on board an A310 from London to Islamabad on delivery flight, it was 1992 or 1993 (I was young and do not remember it well). I do remember a lot of staff lined up to greet the aircraft when it taxied in at Islamabad holding banners. All passengers got rose garlands when we disembarked.